The sustained improvement in the living conditions of young people in need of help in Ethiopia was decisive for MAN Nutzfahrzeuge in entering into partnership with SOS Children's Villages (Kinderdorf). In addition to the construction of a new college building, MAN's social commitment comprises, in particular, passing on technical know-how in the commercial vehicle sector. MAN also provides various exhibits for instruction purposes and trains the teachers locally. "We decided to go with SOS Children's Villages because we can make an enduring improvement to the living conditions of these young people here. Donating money alone is not enough. An important aspect of our commitment consists in passing on our expertise so that young people can acquire qualified training, thus helping them to help themselves. 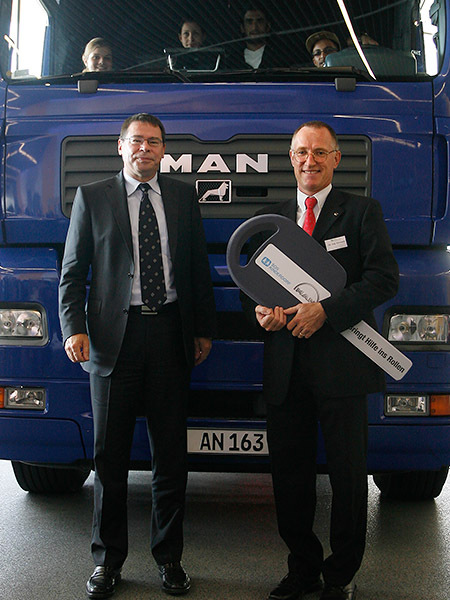 Their training in the growing commercial vehicle sector offers a great deal of potential and increases their chances on the job market," said Anton Weinmann, Chairman of the Executive Board of MAN Nutzfahrzeuge AG, speaking at the handing-over of an MAN TGA 26.460 to SOS Children's Villages for training purposes. May 2009 saw the opening ceremony of the new college building in Addis Abeba, which was financed by MAN. This is where 32 young trainees aged 16 and up will in future spend two years learning the new vocations "Automotive Service and Engine Mechanics" and "Automotive power trains, chassis and drive line". An MAN instructor will visit regularly in order to transfer technical knowledge to teachers and students of the SOS Vocational Training College in Kality. In this way, MAN ensures that the know-how specific to commercial vehicles will be handed on over the long term. Besides receiving theoretical instruction, the youngsters will also train on the real thing. They will be able to test themselves and improve their practical skills on an MAN D20 engine with common-rail injection. As a training object, the new MAN TGA 26.460 will in future enable the trainees to further their product knowledge, which will later stand them in good stead in their careers. The MAN TGA is a vehicle that has been successfully established on the African continent for years. "Well-trained specialists are in demand and for us as a company they are very valuable. 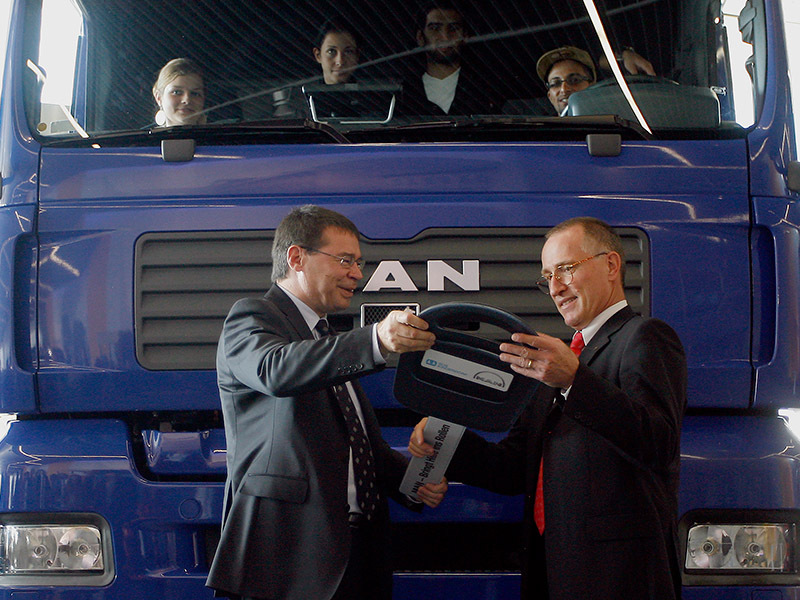 In the long run, by training specialists in MAN commercial vehicle technology we are also offering our customers in Ethiopia first-class service," emphasized Weinmann at the handing-over of the new vehicle. The partnership with SOS Children's Villages has initially been established for three years and will be funded by MAN to the amount of 600,000 euros. Since 1997, SOS Children's Villages has been running the "SOS Vocational Training College Kality" where young people are trained in automotive mechanics, general mechanics and woodwork. MAN has made it possible to add two new vocational courses in the growing sector of commercial vehicles. "The basic right to education and thus to a better future for children and juveniles is the top priority for SOS Children's Villages. In MAN, we are proud to have found a partner who invests in the future of these children in one of the world's poorest countries," says Dr Kay Vorwerk, managing director of SOS-Kinderdorf e.V. in Munich. For MAN Nutzfahrzeuge, this commitment to the education of young people in Ethopia is an important part of its corporate social responsibility. The project also serves as the central account for donations from the company's customers, partners and suppliers.